Do yourself a favour and check this lot out. 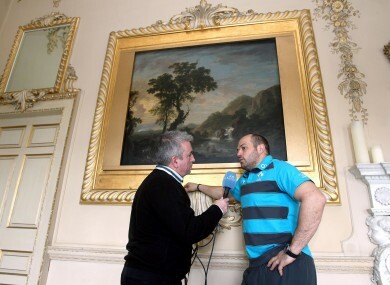 RTE Radio's Michael Corcoran interviews Rory Best. 1. “Congratulations to the anonymous commenter on the Guardian sports blog who took the time out to remark blithely that Paul Lawrie was the ‘third worst’ major champion in history; you have helped create if not a monster then certainly a man with a mission. Like most top-class professional golfers Lawrie, who won the 1999 Open Championship by birdieing Carnoustie’s notorious 18th, the final hole of a play-off, has deep reserves of self-belief but he is no different to anyone else in that he cares about what others think of him. ‘That comment isn’t the reason I started to play well but it really shocked me. That’s a pretty silly thing for anyone to write but you want people think of you with some respect. Lawrence Donegan talks to the man who is spurred on by the likes of you, in the Guardian this week. I tell myself the same thing every morning. Ailis McSweeney‘s column is well worth following on SportsNews Ireland. David Kamp tries to get his head around the Giants’ recent Super Bowl win in the New York Times. One of my favourite Irish blogs – though based in Argentina – Pegamequemegusta looks at the 1978 World Cup. Linsanity took a serious turn last week when an ESPN staffer was fired for writing a headline using a racist slur, though he said later it was unintentional. Grantland’s Jay Caspian Kang looks at the role of race in Jeremy Lin’s rise to super-stardom. This piece, by JR Moehringer, isn’t from this week’s papers – it was published in the La Time 15 years ago – but someone sent it to me this week in the wake of the Chisora fiasco. Email “The Sunday Papers: some of the week's best sportswriting ”. Feedback on “The Sunday Papers: some of the week's best sportswriting ”.